D.E. 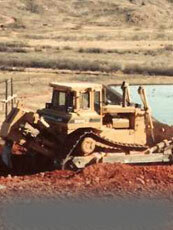 Rice Construction Company, Inc. is in full compliance with DOT regs 49CFR40 and 49CFR199. As a contractor who works extensively with natural gas and hazardous liquid pipeline operators and operators of liquefied natural gas facilities, we were required to be in compliance with these DOT regs by April 20, 1990. We had made a commitment to provide a drug and alcohol free workplace long before we fell under these rules. Our drug program consists of; 1) a written policy on drugs, 2) employee training and supervisor education and 3) drug testing - pre-employment, post-accident, random and for cause. As of January 1, 1995, D.E. Rice Construction Company, Inc. implemented the Research and Special Programs Administration (RSPA) Alcohol regulations as set forth in 49 CFR Part 199, B and 49 CFR Part 40, Subpart C. This alcohol program consists of; 1) a written policy on alcohol misuse, 2) employee training and supervisor education and 3) testing for alcohol under the following work-related conditions - post-accident, reasonable cause, return-to-duty and follow-up.